I thought MK would sell millions easily, especially with the userbase the Switch has. As of September 30, 2018, total sales reached 11.71 million copies. I was going to say it seemed wrong, and it was. Not wrong, just those figures were only for the U.K. and only for last year (compared to 2017) @Sly Reflex @wiivo 2.0. I’ve added a clarification to the previous post for other folks that didn’t realise they were U.K. figures relating to 2018 - comparing to 2017 - only, not commenting on lifetime sales or worldwide 2018/LTD sales figures. 2019 kicks off with ‘FIFA 19’ returning to No1 in the All Formats Chart, overturning ‘Red Dead Redemption 2’s grip on top spot by only a small margin. ‘Red Dead Redemption 2’ has to settle for No2 and with no new releases due until next week there is very little movement elsewhere. EMEAA Chart - Week 52, 2018. "Participating companies in the GSD charts (run by B2boost on behalf of ISFE) are Activision Blizzard, Bandai Namco, Capcom, Codemasters, EA, Focus Home Interactive, Koch Media, Microsoft, Milestone, Paradox, Sega, Sony, Square Enix, Take-Two, Ubisoft and Warner Bros. Notable absentees are Bethesda, Konami and Nintendo. Physical data includes all games, but only those sold in Belgium, Denmark, Finland, France, Italy, Netherlands, Norway, Poland, Portugal, Spain, Sweden and Switzerland. UK will be added to the list from next year." PS4 has now cumulatively sold through more than 91.6 million units*1 globally as of December 31, 2018. More than 50.7 million*4 PS4 games were sold through globally during the 2018 holiday season, which sums up to 876 million*5 PS4 games cumulatively sold through worldwide as of December 31, 2018. Marvel’s Spider-Man, launched in September 2018, has cumulatively sold through more than 9 million copies*6 worldwide as of November 25, 2018. 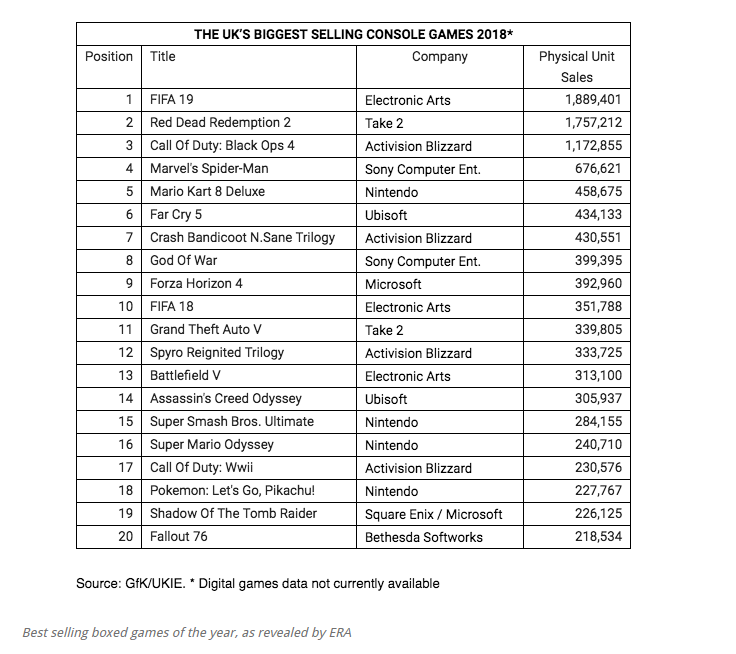 £770 million was generated by UK boxed video game sales in 2018. The second week of 2019 sees a new title at the top; New Super Mario Bros U Deluxe. This means that ‘FIFA 19’ drops to No2 in the All Formats Chart. Another top performer, ‘Red Dead Redemption moves down a place from last week, into No3. Looking down the rest of the chart, there is little movement. EMEAA - Week 2. All formats retail + digital. Super Mario Bros. holds on to top spot. ‘New Super Mario Bros. U Deluxe’ holds on to top spot in the All Formats Chart in the face of strong competition from newcomer ‘Ace Combat 7: Skies Unknown’ which debuts at No2. It is the biggest debut in the long running series’ history for Bandai Namco. Big hitters ‘Red Dead Redemption 2’ and ‘Call of Duty: Black Ops 4’ are non-movers at No3 and No4 respectively while ‘FIFA 19’ drops 3 places to No5. No other new titles manage to break in to the All Formats Top 40 chart this week. I’m surprised nsmb has sold as well as it did to claim No1. Really? Mario's always sell well don't they? Capcom’s biggest franchise storms the All Formats Chart this week with ‘Resident Evil 2’, the remake of the 20 year old original, debuting at No1. The original PS1 ‘Resident Evil 2’ game launched at No1 back in April 1998 and since then the franchise has registered six more different All Formats No1 titles. We may only be 4 weeks in to 2019, but it is the biggest launch of the year so far and Capcom’s biggest lauch since ‘Resident Evil 7: Biohazard’ exactly 2 years ago. Both ‘Red Dead Redemption 2’ and ‘Call of Duty: Black Ops 4’ climb one place to No2 and No3 respectively, while last week’s No1 ‘New Super Mario Bros. U Deluxe’ drops to No4. A price promotion on ‘Just Cause 4’ helps it back in to the All Formats Top 40 at No22. An old favourite takes top spot this week; ‘Red Dead Redemption 2’, rising two places from last week. Another popular title rises this week as ‘FIFA 19’ jumps two places to No2. Last week’s No1 ‘Kingdom Hearts 3’ drops to No3. Looking down the charts we see a new release come in at No34; ‘Monster Energy Supercross 2’. Although Far Cry managed to top the charts, it isn't an especially impressive opening week. The game's launch week sales are 86.5 per cent down over last year's Far Cry 5. Of course, this is a spin-off Far Cry title, and so the comparison isn't overly fair. Yet even compared to 2016's Far Cry Primal (the previous spin-off), sales are a fraction of what we'd typically expect (Far Cry Primal sold almost four times as many units in its first week as New Dawn has). 60 per cent of Far Cry: New Dawn sales came on PS4, 39 per cent on Xbox One, with the rest on PC (physical sales only).